Power Chords will bring you a variety of production flavors supercharged with attitude. Ranging from sparkly clean sounds all the way up to high-gain territory, it is a ‘no-brainer’ deal priced at $19 right now. Resident sound designer at Applied Acoustics Systems, Christian Laffitte infuses high energy into Strum GS-2 with his new sound pack, Power Chords. 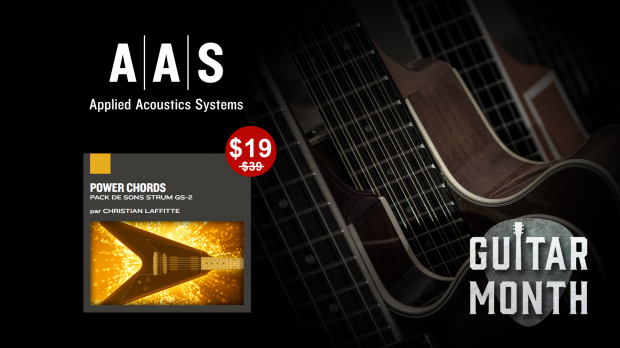 Featuring 13 styles, 92 guitar presets, and 93 strumming patterns playable with your own chord progressions. This entry was posted in DontCrack, Sounds and tagged AAS, Applied Acoustics Systems, Guitar emulation, guitar presets, Power Chords. Bookmark the permalink.